Ulster's Darren Cave admits he would be surprised to see Robbie Henshaw get the nod at fullback despite reports today that the Irish centre is set to fill in at 15 for this weekend's Six Nations opener against England. 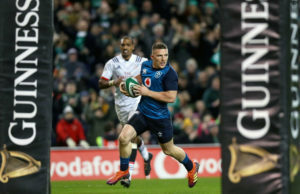 The Leinster midfielder was alleged to have been spotted in the fullback role during a warm weather training camp and Gavin Cummiskey reports in today's Irish Times that he could kick off Ireland's Six Nations defence in the position. Speaking on Wednesday morning's OTB AM, Cave, who has been capped 11 times for Ireland, said he doesn't see this to be the case. "I personally wouldn't consider moving Henshaw to fullback," he said. "Joe [Schmidt] has mentioned that this season. "My personal opinion is Ireland's best midfield is Henshaw with [Garry] Ringrose. But it's very hard after the 2018 Bundee Aki's has had to give no mention to him. "I don't know what's been happening in Portugal. But I would be surprised to see Robbie Henshaw named at fullback. I think he's one of the best centres in the Northern Hemisphere. "I might be a little bit of a traditionalist in that you play your best players in their best positions. I'm not sure what level Rob is at. "I don't think there's as much of a crisis at fullback that we need to start moving players." Andrew Conway scores a try against the USA. Cave pointed out that with the quality Ireland have already in the position, there's no need for such upheaval. "[Andrew] Conway seems to be the forgotten player because of how well [Jordan] Larmour has done," he said. "I think he's had a good 2018. "Every time I've seen Conway play for Munster, he's been brilliant. He was brilliant in the Ireland game against the US and he could do a great job [at fullback]. "Jordan Larmour I would have no problem playing at fullback. Will Addison is another who could do a job but he hasn't played there for Ulster. "It makes for really interesting stuff." "I don't think there's such a 'crisis' at full back..."
For more build up to this weekend's match, check out our preview with Alan Quinlan right here.